Lots of extroverts would rather binge-watch their favorite Netflix show than attend a loud holiday party. Extroverts like deep conversations (something that certain web sites ascribe solely to introversion). Extroverts can get worn out from excessive socializing. Certain web sites portray extroverts as loud, obnoxious, attention-seeking party animals. Most extroverts will not identify with this portrayal. With introversion, your dominant process is oriented towards the inner world. You look inside before looking outside. You are less stimulated by the outer world and by engagement with the outer world than you are by your inner world; thoughts, reflections, and ideas that are internalized. If your inner world is naturally where you go first; if you feel that reflecting, withdrawing into yourself, and separating yourself from the object (external world) is your preferred place to be, then there’s a good chance you’re an introvert. 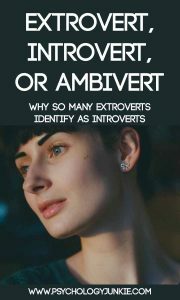 Introversion can take many forms: There are introverted sensors, introverted intuitives, introverted feelers, and introverted thinkers. Your dominant process is oriented towards the outer world. You look outside first, at the objective environment, before looking inside. The outer world is your springing board for ideas, possibilities, experimentation, and engagement. If you look first to the outer world, people, objects, activities, and pursuits in that realm, then there’s a good chance you’re an extrovert. We all have introverted and extroverted functions. If you’re an ENFP you have extraverted intuition and thinking, but you have introverted feeling and sensing. If you’re an ISTP then you have introverted thinking and intuition, but you have extraverted sensing and feeling. We all have times when we are energized by solitude. We all have times when we’re energized by people. We all have certain processes that we keep internalized and hidden, and others that we show readily. Where Do You Find “Flow”? In what mode are you truly “in your element”? What is your default process that gives you energy and motivates you? ENXPs (Ne flow) – You find flow through generating possibilities, theories, and ideas in the outer world. You talk about them, write about them, and explore them and want to make them a reality in the outer world. You are always looking to what “could be” and that idea is constantly transforming. (INPs will also relate to this, but not as consistently as they will relate to Ti or Fi flow states). ESXPs (Se flow) – You find flow through interacting physically in the outer world. You like to get your hands dirty, move, act, experiment, and engage directly with nature and action and excitement. You are an opportunist, a risk-taker, a person of action, spontaneous, open-minded, and ready to take life by the horns. (ISPs will also relate to this, but not as consistently as they will relate to Ti or Fi flow states). EXTJs (Te flow) – You find flow through deciding, directing, and logically organizing the outer world. You make things happen efficiently and you focus on goals and productivity. You’re direct, straightforward, hard-working, and determined. You like things planned, organized, and prepared. (ITJs will also relate to this, but not as consistently as they will relate to Ni or Si flow states). EXFJs (Fe flow) – You find flow through creating harmony, connecting with people, and understanding them. Relationships, friendships, and meeting the needs of others drive you. You are motivated to improve the lives of people and you are thrilled when you find shared values and goals with others. (IFJs will also relate to this, but not as consistently as they will relate to Ni or Si flow states). INXJs (Ni flow) – You find flow through following an internal, abstract vision down a rabbit hole and seeing where it goes. You get “flashes” of insight and symbolic meaning that drive you and compel you to look further beneath the surface. (ENJs will also relate to this, but not as consistently as they will relate to Te or Fe flow states). IXFPs (Fi flow) – You find flow through examining your values and living in accordance with them. You are in touch with your conscience, with your purpose, with a vision of the right way to live your life. You strive to be individualistic, authentic, and to fight for your ideals and values regardless of the cost. (EFPs will also relate to this, but not as consistently as they will relate to Ne or Se flow states). ISXJs (Si flow) – You find flow through reflecting carefully on the details of your past experiences. You have strong impressions about the concrete world around you and can instantly spot changes and new patterns. You remember the details of important people, places, or things and have a memory that is vivid and nuanced. (ESJs will also relate to this, but not as consistently as they will relate to Te or Fe flow states). IXTPs (Ti flow) – You find flow through creating a vast internal blueprint for how the world works. You want to understand deeply the core truth of everything and you want to sift through all the information you have to decide how it should be classified, which data is true and which is unnecessary. You like to solve problems, analyze, research, and categorize. (ETPs will also relate to this, but not as consistently as they will relate to Ne or Se flow states). So Where Do You Look First? Do you look outside, to people, projects, actions, and ideas?? Or do you look inside to inner ideas, impressions, memories, logical principles, or subjective values? Are you more happy engaging in the outer world or the inner world? You can be a shy extrovert, a quiet extrovert, a loud extrovert, a deep-thinking extrovert, or a gregarious extrovert. You can be a shy introvert, a loud introvert, a confident introvert, or a friendly introvert. All that matters is where you look first; to the outer or inner world. So just as there isn’t one type of introvert, there isn’t one type of extrovert. Many of us when considering extroversion think of the most outgoing, talkative, “people person” we know. When we don’t match up with that person we automatically assume we’re an introvert, when really that has nothing to do with it. I’ve met some very quiet, thoughtful, deep extroverts. I’ve met quiet, thoughtful, deep introverts. It’s all about where you put your energy first and where you focus most of your attention. How do you experience extroversion or introversion? Share your thoughts in the comments! Many of ESTP are lonely wolves. The older they are, the more they are. But they retain their dynamism, intellectual vivacity and social style. They are usually very assertive. With, ISTP it’s an other specie, feline.